It was founded by the Assembly of the City of Belgrade in 1958. It has a staff of about 115 employees. The Swimming area includes an outdoor and an indoor swimming pool with the stands for 2000 spectators, a diving platform for diving from 1, 3, 5 and 10 m diving boards, and 16 underwater windows for underwater film shooting. 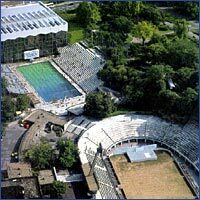 In the swimming pools of this Sports Center, the First World Championship in Water Polo and Highboard Diving was held in 1973. Apart from instructions for non-swimmers, the swimming pools are used by the schools of synchronized swimming, water polo, and skin/scuba diving. Open-air stadium "Tašmajdan" has the stands for 5000 spectators and it is intended for indoor football, basketball, fencing, and volleyball. The Recreation Center has the programs of aerobics, fitness, massage, bodybuilding, and therapeutic gymnastics, as well as a sauna and a solarium. It is intended for all kinds of court games, with 6000 seats. The hall is suitable for: gymnastics, basketball, volleyball, handball, tennis, and contact sports. It is provided with all the ancillary facilities (locker rooms, a medical center, club). It is intended for all sports on ice, and within the hall there are both the main and the auxiliary ice rinks, as well as all the ancillary facilities. The hall has 2000 seats.